The Mt. Tabor Cemetery is located on County Road #299. 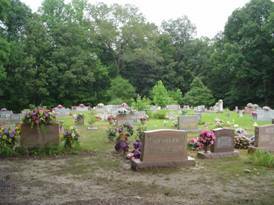 To reach the cemetery travel north from Florence on State Highway 17 to Zip City, Alabama. In Zip City, turn right onto County Road 8. Travel .6 mile and where County Road 8 makes a sharp right turn, continue north on County Road #299 for 1.5 miles to the cemetery on the right. The annual homecoming & decoration day at Mt. Tabor is the second Sunday in May (Mothers Day) of each year. 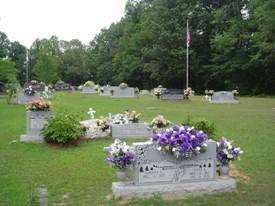 This cemetery contains a pretty large number of very old graves marked with fieldstones or other objects. Bradley, Edith E.; b. 01 Nov 1934, d. 05 Sep 1935, daughter of O.P. & L.D. Bradley, infant; b. & d. 06 Nov 1930, daughter of O.P & L.D. Dickey, infant; b. & d. 01 Mar 1914, son of W.E. & S.A.
Dickey, infant; b. & d. 07 Jun 1917, infant of C.H. & R.L. Dickey, W. T.; b. 07 Dec 1918, d. 11 Feb 1919, son of W.E. & S.A.
Foor, Angela (Rhodes); b. 02 Mar 1963, d. 18 Apr 2011, wife of Johnny K.
Hines, J.M. ; b. 25 Mar 1866, d. 15 Apr 1900, son of J.G. & M.A. House, Annie; b. 1860, d. 1937, wife of J.L. House, Claude; b. Jul 1897, d. Feb 1898, son of J.L. & N.A. House, Thomas A.; b. 13 Dec 1893, d. 05 Feb 1916, son of J.L. & N.A. Hubbard, infant; 1931, infant of C.L. & S.E. Hubbard, infant; 1932, infant of C.L. & S.E. Hubbard, Peggy Jean; b. 25 Apr 1952, d. 31 Mar 1964, daughter of C.L. & S.E. Hubbard, Roulen Neal; b. 01 Jan 1928, d. 19 May 1929, son of T.T. & Nancie L.
Hubbard, Scott P.; b. 14 Nov 1949, d. 21 May 2003, son of Cecil & Sarah E.
Hughes, Olles B.; b. 24 Mar 1900, d. 28 Sep 1900, son of J.W. & I.E. Keeton, Barbara J. (Pruitt); b. 07 Feb 1936, wife of Jimmy O.
Kelley, infant; b. 25 Apr 1924, d. 29 Apr 1924, son of Charles M. & Mattie M.
Lawson, Emma (Hubbard); b. 09 Aug 1886, d. 18 Jun 1909, wife of Joe R.
Lawson, Rannel D.; b. 27 Aug 1935, d. 27 Jun 1936, son of Harold C. & Emmer E.
Liles, Walter E.; b. 11 Jul 1897, d. 04 Aug 1917, son of J.C. & N. E.
Olive, Frances; b. 03 May 1912, d. 30 May 1929, daughter of J.S. & E.M.
Patterson, J.D. ; b. 14 Feb 1903, d. 23 Jul 1905, son of T.M. & L.E. Phillips, Ida May; b. 25 Jan 1908, d. 05 Mar 1908, daughter of D.J. & L.D. Phillips, Walter Edison; b. 12 May 1909, d. 07 Oct 1909, son of D.J. & L.D. Pruitt, Dora A.; b. 30 May 1885, d. 22 Jul 1886, daughter of T.D. & S.A.
Pruitt, Eliza E.; b. 04 Oct 1873, d. 16 Jun 1879, daughter of T.D. & S.A.
Pruitt, Huldy; b. 01 Dec 1887, d. 08 Oct 1890, daughter of W.J. & L.G. Pruitt, Mildred; b. 24 Jan 1892, d. 24 Oct 1895, daughter of W.J. & L.G. Pruitt, P.I. ; b. 08 Dec 1885, d. 14 Mar 1919, daughter of W.J. & L.C. Pruitt, William E.; b. 19 Apr 1922, d. 16 May 1922, son of W.H. & L.E. Rhodes, Earl “Chock”; b. 02 Jul 1924, d. 06 Nov 2014, husband of Lucy A.
Rhodes, infant; 14 Dec 1912, son of J.H. & L.O. Rhodes, Jessie S.; no dates, wife of W.T. Rhodes, Martha A.; b. 30 Jan 1850, d. 17 May 1920, wife of B.F.
Watkins, Mitey D.; b. 29 Jun 1899, d. 03 Oct 1899, daughter of W.L. & B.
Wilson, William C.; b. 15 Oct 1938, d. 25 Jan 1958, son of F.T. & M.M.